One lucky slots player from Sweden got more than bargained for when playing the Joker Millions slot machine at LeoVegas casino, ending the day with a huge €7,832,262.02 jackpot win. We’ve seen much bigger slot wins before, we’ve seen much smaller wins before, but the Yggdrasil’s Joker Millions slot still becomes a record breaker (of sorts) recording the biggest ever win for any of the Yggdrasil jackpot slots. The previous biggest win was back in July 2017 when their Empire Fortune slot recorded a €5,197,198 win. “We are thrilled to see a player win such a life-changing sum of money, especially this close to Christmas and while playing one of our slots games on mobile.” said Fredrik Elmqvist, CEO at Yggdrasil. 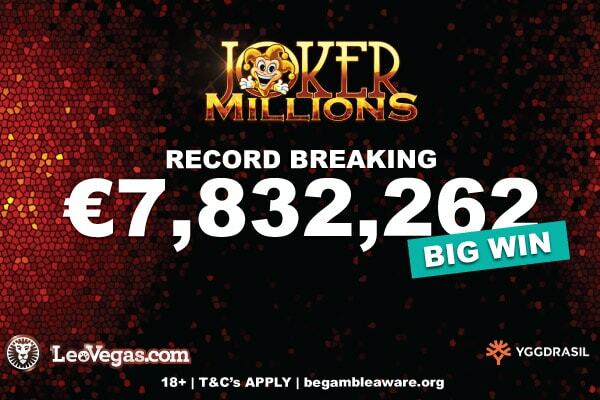 This 7 million win isn’t the first time that the Joker Millions slot machine has recorded a huge win. Back in November 2017, another player hit €3,482,819 at Vera&John casino within 60 seconds of opening the game. It’s also not the first time that this Yggdrasil game has been won at LeoVegas casino. We wrote back in July 2016 how Chris managed to win over €2.9 million betting €1.25 per spin. This time it took LeoVegas’s Swedish casino player a bet of 5 SEK or around 50 cents to win while playing on their mobile. Which goes to show that you don’t have to bet big to win big and you don’t have to play online via your desktop or laptop to win big either. Mobile gambling has experienced massive growth over recent years and is far becoming one of the most popular ways to gamble online, with providers making sure their slot games work seamlessly across all platforms you now have the same chance to win big anywhere with an internet connection. It was Yggdrasil’s first ever Jackpot game, and combined with their other progressive slot has paid out a whopping €26.9 million to date since they launched back in 2015. It’s not quite as high as the €948 million Microgaming jackpots have paid out over the years, but for a smaller provider with fewer games and fewer years in gaming, it’s an impressive sum none the less. At heart it’s a simple video slot featuring sticky wins or as Yggdrasil like to call them Freeze re-spins. When you find 3 or more symbols on an active payline, the symbols containing the win will stay in place, and the rest of the symbols will spin in the hope to lock more in. If you do, you’ll get another re-spin until the screen is full of the same symbol or no more symbols occur. It’s a feature made infamous by NetEnt’s Jack Hammer slot and one which has been used by many other providers to create some exciting slot machines. Much like other progressive jackpot slots online you might have noticed that the theoretical Return to Player rate is much lower than other casino games which nowadays tend to be above 96%, with the games with the best payouts around 97% – 98% mark. This means you can expect smaller base game wins, and less frequent wins as part of your real money bets are used to keep that progressive jackpot going up and up. With over SEK 80 million in the bank, we are not quite sure what the lucky winner is going to do with their winnings. They are keeping quiet not giving away any details, but we’re confident that like many others there are plans for a few exciting times ahead whether that’s holidays, a new house, a new car or buying a private island. We’re sure they’re going to have fun spending their newly won fortune. Are you a fan of progressive jackpot slots? If you like to play on jackpot games where the ability to win life-changing sums is potentially only one spin away, then you’re in luck as LeoVegas host many of the top jackpots online and mobile. The list goes on. 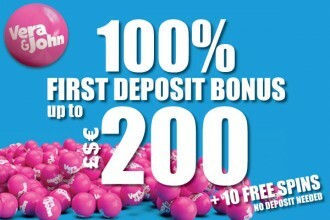 At the time of writing the Mega Moolah jackpot had reached over €8 million tempting many avid slots fans to take a spin. The question is how lucky do you feel? Try your luck at LeoVegas casino and see if Lady Luck is shining a light on your gaming action today.